I’m not bragging. I just want to say it while I still can. My past colonies have survived the winters of 2014, 2015, 2016 and 2017 and have greeted the arrival of every spring with renewed strength. I fear this winter will be different. Of course, I always fear for them, every winter. But this time round I know for certain that some of the colonies are weak, small, and low on stores. Queen Romaine’s colony are the most vulnerable. They showed no signs of EFB, but it is almost certain that they were exposed to it because they shared combs with their sister colony, that of the late Queen Storm. Romaine’s colony have suffered this year and are heading for winter with a dangerously low population of bees and dangerously low levels of stores. And what is more, I think they are heavily raiding those stores already. 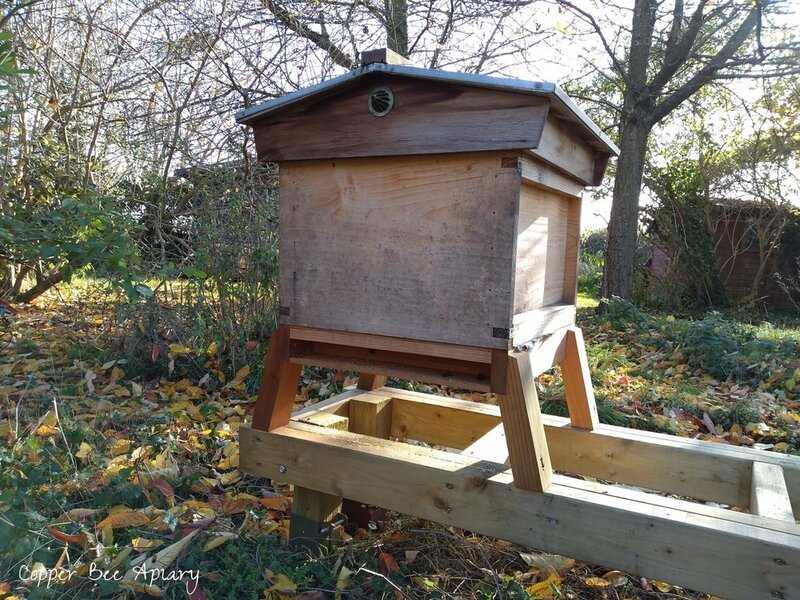 About a week ago there was a heavy sprinkling of wax dust on the hive stand at the back of the hive. I brushed it away. Now there’s more, and a heavy sprinking of wax dust on the hive stand at front of the hive too. And some on the landing board. Dust from the wax cappings of honey comb? If it is, the bees are feasting on their honey stores. It’s only November, and they didn’t have much in the way of stores in the first place. So, this year, I’ll be going “all in” on winter feeding. And next year, I’m going “hands off” on honey. Just hang in there, bees. I saw water foraging bees at the pond* today. There is a Lamb’s ears (Stachys) plant growing by the pond’s edge, and bees were drinking beads of water from the hairy leaf surfaces. Safer and easier than perching on a floating lilypad, I suppose. I wondered if they had come from Queen Romaine’s hive and were taking water back to mix with the honey. *referring to the existing little pond by the house. But I am embarking on digging a new, bigger one, within the apiary itself.